The legend of the disappearing house is the most popular story told. The most common description is a small white two-story house with a porch. It has also been described as 1850s to 1890s vintage and Victorian-style. Other common descriptions include a light shining through a window on the second floor, a swing hanging over the porch, wooden pillars near the porch, as well as a small picket fence close by. Initial sightings of the house are likely to have originated as far back as the mid 1950s with early 1960s reports being prevalent. The nature of why it is called the disappearing house has variations. One common report is that the house, which usually appears very solid and real, is visible on one visit but upon follow-up visits it is nowhere to be found. Another common report is witnessing a house out near the cemetery but later the witness hears that no house is known to exist in the area. A portion of those witnesses who later hear that no house exists, however, do not return to look for it out of fear and other various reasons. As far as the last two commonalities are concerned, it is plausible that the time period reflects a visitation just before one of the original settlers homes were completely torn down after being acquired by the Forest Preserve District. There are, however, aerial photographs from the 1950s which suggest that it could have been difficult to see any real houses west of the cemetery due to vegetation growth if only visiting the cemetery itself. Further research is required as to when they may have been demolished. In other accounts witnesses experience a transparent-like image of the house. This can vary from the entire house looking transparent to one of the windows appearing odd in some fashion. The light which emanates from the window has been said to flicker like a flame while giving off a "yellow-orange" color. Occasionally witnesses report the house as "shrinking" when they approach it and eventually disappears from their view. According to some of the earliest researchers the house is usually described in the same fashion no matter where it is seen. Some reports locate it off of the old Midlothian Turnpike near the south and southwest ends of the cemetery, as well as on the west side of Tinley Creek near the west and northwest area adjacent to the cemetery. Rare reports even place the house within the cemetery itself and just outside the main entrance on the south end. Overall, it has been reported on both sides of the old Midlothian Turnpike in close proximity to the cemetery. A 1974 quote from researcher Richard Crowe in Illinois within the Chicago Tribune states, "At night, people see an old one-story frame house-it's been spotted on both sides of the dirt road as you enter the cemetery." An eyewitness had also come forward for Crowe's 1985 documentary The Ghosts of Chicago stating it was one-story. These are the only verifiable references thus far stating that it was one-story high, as opposed to the usual report of two-story. Some of the earliest known material that documents where the house is reported to appear at, as well as detailed descriptions of it, is in the possession of Richard Crowe. The material includes a hand-drawn map of the general area with markings indicating different sections around the cemetery where it has been sighted. Dale Kaczmarek of the Ghost Research Society in Oak Lawn, Illinois is also said to have a similar map of the area. Within the 2000 book Beyond The Grave it mentions Kaczmarek as having interviewed dozens of individuals that have witnessed paranormal activity at the cemetery where many of them have contributed to the map. None of the hand-drawn maps by either party have ever been made available for viewing to the general public. There are also various sketches of the house. Within the 1985 documentary The Ghosts of Chicago, Richard Crowe includes two eyewitnesses each presenting their own hand-drawn sketches. These sketches are the only known publicly released images which represent the disappearing house by eyewitnesses. In more recent years a photograph was released of a real house that existed a short distance west of the cemetery which was captured in the 1890s. The photograph, which was provided by ancestors of the Schmidt family whom used to own the property surrounding the cemetery, does not fit the common detailed descriptions of the disappearing house as questioned by some researchers. An additional photograph from 1914, later discovered and sent in by the same family, interestingly comes closer to the descriptions such as a porch, pillars and a small picket fence in the background. This house was also located a short distance west of the cemetery. 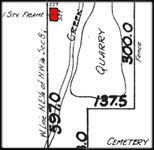 As of October of 2011, official Plat of Survey maps concerning property transactions have lead to the discovery of additional structures surrounding the cemetery. The maps and other documentation contain specific details as to barns, houses, silos, sheds, etc,. It appears that many more homes existed near the cemetery. The records also indicate details about the house within the 1914 photograph including how many bedrooms, wells, hen house, hog house, etc,. More time is required to analyze over a hundred of the recently discovered documents. During a 1987 WLS television broadcast, Ted Visnec of Illinois spoke of his own experience with a"farm-style" house. In the interview he points and walks toward the direction of where he and his associates all saw the house, which would be within the northwest area adjacent to the cemetery. One interesting document that may relate to the sighting is a Plat of Survey map created on March 12, 1928 which was recently discovered in 2011. Within the map it indicates a one story frame house 22 x 32 feet in diameter, once owned by Christ Boehm, located in the direction of where Visnec was walking and pointing toward in the broadcast. Further documents are being recovered about the property which may reveal why no physical signs of the house exist such as concrete foundations. During the broadcast Visnic stated, "It had to be about 1973 it was like, when we saw that, we were walking off there with me and some of my friends and we saw the house, you know like that. It was like during the day which was like strange cause you'd think you'd see it, you know, at night time or somethin." He also added, "The house looked like, like a farm-style house, you know like a, one, you know like one big building, you know like that, it wasn't like a new modern building or anything like that"
According to an audio transcript of a speech given by a school teacher, in approximately 1969 there is supposed to have been a newspaper article describing three high school girls as witnesses to a disappearing house. It is said that after parking on the now defunct 143rd Street pull-off next to the pond near the cemetery, they proceeded to walk south on the narrow path between the pond and creek. As they approach the area between the creek and the western side of the fence to the cemetery, there was an old house in front of them with a light shining through the window. They stated it did not appear to be lit by electricity but by some kind of flickering flame. As they walked toward it each of them felt that the house was like a mirage, it was as if the closer they got to it the further it appeared to them. The girls eventually left the area out of fear and headed directly to the Midlothian police station. After telling police what they saw, officers instructed them to sketch the house on paper. All three drew the same description and it is also said that other witnesses had come forward in the past sketching the same image. What ever may have happened to these sketches is unknown. Possibly in relation to the story is an interesting object seen a short distance directly south of the cemetery within an aerial photograph captured in 1951, which happens to be in the direction of where the story places the sighting. This same image has become the subject of debate among some researchers. The area at that time was wide open such as a prairie and could have easily been viewed from the cemetery. Whether or not it was a house or barn is something that is still left to speculation. Although the rectangle shaped object casts a type of shadow that is not uncommon for a man-made structure, no physical evidence has been discovered at the site thus far to indicate that any man-made structure had existed. In July of 1976 three brothers decided to stop by the cemetery while on their way to a carnival. During their visit one of them made a comment about getting a sandwich from a house nearby. As two of the brothers looked in the direction of where it was located one of them stated, "I didn't see that house when we came in, maybe it's the caretaker's house?" All of them continued to walk around the area and upon leaving at 8:30 P.M. they noticed that the house was no longer there. It was not until October of that same year when they learned about reports of a disappearing house near the cemetery. There was no indication as to the exact location where the house was sighted but it was described as a small white house with a "golden light" coming from two windows. While as a guest on a 1982 WBBM radio broadcast in Chicago, Dale Kaczmarek spoke of a woman that had brought a group of children to the cemetery. In 1965 they were all visiting the area due to hearing "that some strange things happen back there" but did not know there was a cemetery. Kaczmarek then added, "they saw this house, off to the right, 60 to 70 yards away." He described the sighting as a "big farm house" where it began to get "smaller and smaller" , as if "shrinking" , and it went "farther and farther away." There were no details as to where they were standing at the time. Kaczmarek mentions within his 2000 book Windy City Ghosts that Arlene McComb witnessed the house with a group of friends in 1975. He described all of them as watching the house as it began to shrink in size until disappearing. On page 85 he also spoke of Grace Nortman witnessing the house during the Winter of 1966/1967 and Marianne Kerbs experiencing it in 1966. It was never indicated but all of the witnesses are presumed to have been residents of Illinois. Authors will often speak of the classic tale that there are no records or any other evidence of a home ever being built anywhere near the cemetery. Contrary to popular legend, there are at least four homes, and other structures, that did in fact exist relatively close to the cemetery. Among the evidence are maps from 1901 and 1904 which indicate that there were man-made structures next to the cemetery. It should be noted, although not considered extremely accurate in terms of distance, one of the maps also indicates a structure in the same area where the "shadow" is located in the 1951 aerial photograph. As far back as 1977, through a radio broadcast in Chicago, Richard Crowe had stated that there was physical evidence of houses that once existed near the cemetery that he witnessed first-hand. How the tale of no evidence existing of a house continued to be published as fact after this time period is partially left to speculation. It is likely that comments from Crowe, such as within Brad Steiger's 1976 book Psychic City Chicago, had created more solid material for future authors to reference. On page 88 it states, "old records show that there never has been a house there." It is from this same book that the earliest verifiable reference to the classic tale of people not returning from the house if they enter it is found. Although Crowe stated "Perhaps those who do never return to tell about it" he added that no one has ever claimed to have entered it. Over the years quite a number of authors give general reference to the story of no one ever returning from the house. Today, you will often find that most authors now leave out the story of no evidence existing of a house. This is likely due to the fact that many people are visiting the foundations to the old homes both east and west of the cemetery, which has also gained a fair amount of popularity when visiting the area. According to research by Crowe, the disappearing house was witnessed more frequently in the mid 1970s than the blue light phenomenon. Reports of the disappearing house continue to the present day but the majority of them are lacking any specific details and the volume of reports are few and far between. Although Crowe had stated in a 2011 interview that reports of paranormal activity were "first put into print" during the 1970s, he also mentioned that the stories were spoken of orally prior to that time period. Current research efforts into recovering newspaper articles to substantiate the claims dating to 1963 have not been successful. There is, however, testimony from multiple sources to support that newspaper articles do exist and the research continues. There has been some confusion about the story of a "Magic House" while speaking with visitors at the cemetery. The origin to the phrase Magic House can be traced back to the 1985 book Haunted Heartland by Beth Scott and Michael Norman. Its use resurfaced in 1999 within the book Chicago Haunts by Ursula Bielski, and again in 2003 by the same author within the book Creepy Chicago, which also appears to be the reason why it is often mentioned in more modern times. What separates the descriptions in Creepy Chicago from that of Haunted Heartland is that on page 4 of Haunted Heartland it states, "A 'Magic House' occasionally appears in a shroud-like mist" as well as "The house floats into view only rarely." Although there is no mention of a "mist" or the house "floating" in Creepy Chicago, there is a vague reference to the phrase "floating house" in Chicago Haunts. It is obvious, however, that all three books use the phrase Magic House in relation to the disappearing house. Still, the phrase causes some confusion as to what it means. Overall, the modern-day description of a "floating house" may have more to do with the idea that the house is reported in different locations around the cemetery.